Danuel House unexpectedly made his way into the Rockets rotation earlier this season before taking a G League hiatus. Now, signed for the rest of the year, House will continue to make an impact for Houston. Two-way players are limited to 45 days of NBA service, or the prorated equivalent. House, who was on that type of deal prior to reworking his contract with the Rockets, hit that mark in mid-January. Houston then sent him down to the G League and attempted to rework his deal — the organization reportedly wanted to lock him up for three seasons, even offering a fully guaranteed deal to get him to sign. GM Daryl Morey is no stranger to shrewd moves and adding two extra seasons of team control to a player who’s proven he can be a contributor in the rotation is another example of Morey attempting to make the most out of the margins. House’s reps didn’t have a ton of leverage, though they had to option to wait it out. House would be eligible for restricted free agency at season’s end if the Rockets left his two-way deal alone or converted him to a standard contract. The latter occurred earlier this week, allowing the team to get a talented player back with enough time to get him re-integrated for a playoff run. After having his two-way deal officially converted into a standard NBA contract today, Danuel House is happy to be back with the Rockets, telling reporters he’s “really excited that we got everything done,” as Jonathan Feigen of The Houston Chronicle writes. Head coach Mike D’Antoni is also glad to have House on the 15-man roster, per Feigen. While House played a regular rotation role for the Rockets earlier in the season, even starting 12 games, the team has a healthier roster and a deeper bench at this point. Feigen notes in a separate article that it will be interesting to see how Houston manages all its pieces the rest of the way. Currently, the Rockets’ bench features Austin Rivers, Gerald Green, Kenneth Faried, Nene, Iman Shumpert, and House, among others, so the club figures to use the final month to assess how many of those players will see regular minutes in the postseason. Thirteen months after undergoing ACL surgery, Kristaps Porzingis participated in his first 5-on-5 practice for the Mavericks on Wednesday. And according to Dwain Price of Mavs.com, all indications are that it was a very successful return for the big man. “He went through a full practice with no issues, so very encouraging,” head coach Rick Carlisle said. “He’s made tremendous progress with his rehab, with his conditioning, his strength, and (playing 5-on-5) was the next logical progression. He played 3-on-3 yesterday morning with some of the other guys and did extremely well there. So this went really well.” Porzingis still isn’t expected to return to game action until 2019/20. Grizzlies center Jonas Valanciunas has made a strong early impression on his new club in Memphis, as Blake Murphy of The Athletic details. David Cobb of The Memphis Commercial Appeal also takes a look at Valanciunas’ first month with the Grizzlies and looks ahead to assess whether or not the 26-year-old will exercise his $17.6MM player option for next season. In a column for The Memphis Commercial Appeal, Mark Giannotto argues that the Grizzlies have been better off without Marc Gasol in recent weeks, as they’ve played at a faster pace and appear to be having more fun on the court. While it was painful to see Gasol go, it’s becoming clear that the two sides needed to move on from one another to move forward, Giannotto writes. MARCH 13: The Rockets have officially converted House’s two-way deal into a standard NBA contract, the club announced today in a press release. House can now rejoin the club and will be eligible for the postseason. MARCH 12: The Rockets will fill one of the openings on their 15-man roster by converting Danuel House‘s two-way contract to a standard NBA deal, according to Shams Charania and Kelly Iko of The Athletic (Twitter link). The move will ensure Houston gets back up to 14 players, the league-mandated minimum, for the time being. House, 25, signed a two-way deal with Houston back in December and emerged as a reliable rotation piece for the club, averaging 9.0 PPG and 3.6 RPG on .458/.390/.818 shooting in 25 games (24.8 MPG). But because two-way players can only spend a certain amount of time in the NBA, House hasn’t appeared in a game for the Rockets since January 14, when he reached that limit. The two sides tried to reach a new contract agreement at that time, with the Rockets reportedly offering House a guaranteed three-year, minimum-salary deal. However, House and his agent Raymond Brothers wanted the club to simply convert the swingman’s two-way contract into a rest-of-season deal, which a team can do unilaterally. That would allow House to reach restricted free agency at season’s end. The Rockets initially resisted, but now that the team is gearing up to go “all-in” for a playoff run, management has prioritized getting House back in the fold rather than worrying about his offseason free agency, writes Jonathan Feigen of The Houston Chronicle. Brothers thanked the Rockets and GM Daryl Morey for discussing a multiyear deal and suggested that he hoped to resume those talks in the summer, per Mark Berman of FOX26 Houston (Twitter link). Assuming Houston issues a qualifying offer to House, the club will have the ability to match an offer sheet up to a certain amount using his Non-Bird rights. If the Rockets officially convert House’s contract on Wednesday, he’d earn approximately $248K during the season’s final month. As for the team’s roster situation, adding House to the 15-man squad would give Houston 14 players, but Terrence Jones‘ 10-day deal is set to expire later this week. As such, the Rockets would have to eventually re-sign Jones or add a new 14th man to get back up to the minimum. Grizzlies forward Chandler Parsons is set to rejoin the rotation for the remainder of the season, David Cobb of the Memphis Commercial Appeal writes. Parsons has played just three games this season, mutually agreeing to separate from the team early last month as trade talks began to heat up. Parsons’ tenure with the Grizzlies has been tumultuous since he originally joining the franchise on a maximum-salary deal in the summer of 2016. Despite his future looking murky before this month’s deadline, Parsons insists he had no interest in leaving the team in a trade. Parsons was sidelined to start the season with knee soreness, but has worked his way back to game shape after several months away from the court. The Grizzlies own the second-worst record in the Western Conference at 23-36. Danuel House is hopeful to return to the Rockets this season, he stated in an interview with David Yapkowitz of Basketball Insiders. “Hopefully I can go back to Houston and compete for a title,” he said. “There’s nothing like learning from James [Harden] and Chris Paul, Gerald Green, Eric Gordon and those guys. And now with the additions of [Iman] Shumpert and Kenneth Faried, I’m just excited to hopefully get something done so I can be out there and competing with those guys.” House was unable to agree on a new contract with the Rockets last month, currently playing for the team’s G League affiliate in Rio Grande. With Kenneth Faried poised to join the Rockets once he clears waivers, Houston may finally get the type of backup big man it has long been seeking. As Kelly Iko of The Athletic explains, the Rockets hoped that Brandan Wright – and then Marquese Chriss – would be the sort of athletic big who could roll to the rim, catch lobs, and rebound for the second unit. Health issues sidelined Wright, and Chriss hasn’t been a great fit, so the Rockets will try their luck with Faried. Adding Faried will also address Houston’s frontcourt depth for the time being, meaning the team can shift its focus back to the wing as the trade deadline approaches. Iko identifies a number of potential trade targets for the Rockets, so his article is worth checking out in full for those suggestions. While a trade remains the preferred outcome for both the Rockets and Carmelo Anthony, a buyout “isn’t off the table,” league sources tell Iko. Iko names the Lakers, Heat, and Pistons as teams that could be willing to take a chance on Anthony. According to Iko, Danuel House‘s representatives were interested in a deal that would have paid House a “significant chunk” of the Rockets‘ mid-level exception. “He essentially wants to get paid like a top-seven pick,” one source said of House. As of today, Houston should have about $3.64MM of its MLE left, though that number declines a little every day. Iko notes that GM Daryl Morey wants to hang onto that exception for flexibility. I explored House’s stalemate with the Rockets right here. Sources tell Iko that the Heat don’t really want to take back any salary if they move Wayne Ellington. It’s not clear if that’s a reference to multiyear salary or if Miami doesn’t want to take back any money at all in a potential Ellington deal. The latter would be trickier – a trade partner would need cap room or a traded player exception to accommodate the sharpshooter’s $6.27MM salary – but would be financially advantageous for the Heat. It appears they could dip ever so slightly below the tax line by getting off Ellington’s contract. The Rockets made an effort to lock up two-way player Danuel House to a standard NBA contract on Tuesday, but the two sides ultimately couldn’t reach a deal, prompting the team to instead use its open roster spot to sign James Nunnally. Nunnally’s 10-day contract is expected to be finalized later today. It’s a somewhat surprising outcome. House had been an important part of Houston’s rotation over the last couple months, averaging 9.0 PPG and 3.6 RPG with a .458/.390/.818 shooting line and playing solid defense in 25 games (24.8 MPG). Now, because he has reached the limit for the number of days a two-way player can spend in the NBA, he’ll be relegated to the G League most of the rest of the way, unless he and the Rockets can find common ground on a new deal. Unilaterally convert his two-way contract into a one-year, minimum-salary contract. Offer him a two-year, minimum-salary contract using the minimum salary exception. Offer him a three-year contract using some of the taxpayer mid-level exception. Keep him in the G League, where he’ll be ineligible to appear in NBA games until at least March 24 and won’t be playoff-eligible. 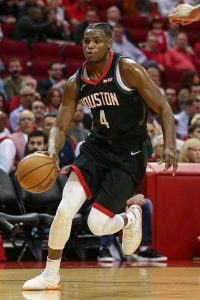 There were initially some conflicting reports on what the Rockets offered House, but agent Raymond Brothers told Tim MacMahon of ESPN.com (Twitter link) that the team’s proposal was a three-year, minimum-salary deal. Houston would have to use part of its mid-level exception to complete the signing, since the minimum salary exception can only be used for one- or two-year contracts. When House and Brothers passed on that offer, the Rockets offered the same three-year, minimum-salary deal, fully guaranteed. “We rejected both offers and asked the Rockets to convert him for the remainder of the season,” Brothers said. As MacMahon observes, House and Brothers want the opportunity for the 25-year-old to reach restricted free agency this summer, rather than having him play on a minimum-salary contract for multiple years. The Rockets, meanwhile, don’t want to set a precedent of converting two-way contracts into standard one-year deals for players they spend time developing, MacMahon tweets. Houston would prefer a multiyear commitment from those players, as Jonathan Feigen of The Houston Chronicle confirms, and feel that a guaranteed three-year, $4.16MM offer is fair, since that’s more guaranteed money than most second-round picks – or even late first-rounders – receive. It’s an interesting standoff. It may look like a poor decision by House to play out the season in the G League, where he’ll continue earning his very modest two-way salary rather than an NBA salary. He’s passing on more guaranteed money than he has earned so far in his NBA career, and will spend at least the next couple months playing for the Rio Grande Valley Vipers rather than a potential Finals contender. Still, as cap expert Albert Namhad tweets, accepting Houston’s offer would also mean House takes the minimum salary through his age-27 season. If he believes he can get a better offer in the offseason, it may be worth it to wait. Remaining on his two-way contract will put him in line for restricted free agency in July. As for the Rockets, they could end the stalemate at any time by unilaterally converting House’s two-way contract into a standard minimum-salary deal, which is the option House and Brothers prefer. Perhaps it would set an unfavorable precedent in Houston going forward, but every case is different and few two-way players are likely to have the same sort of impact in the future that House has had this season. If the Rockets want to maximize their playoff chances and they don’t find a wing capable of matching House’s impact, they may have to bite the bullet and convert his contract at some point. January 15 was the deadline to sign players to two-way contracts, but House and the Rockets will have until April 10, the final day of the regular season, to work out a deal. Houston simply won’t be able to sign a new two-way player if House is promoted to the 15-man roster. If House and Brothers don’t relent and accept a multiyear contract, the most likely path may be one suggested by Nahmad (via Twitter). As he points out, the Rockets could recall House from the G League after the Vipers’ season ends (March 24 at the earliest), and then could convert his two-way deal into a standard contract at the very end of the season (April 10). That would significantly limit the money Houston would owe House this season, it would allow him to play in the postseason, and it would put him on track for restricted free agency this summer. It may not be a perfect outcome, but it’d be a reasonable compromise. 8:46pm: House’s agent, Raymond Brothers, claims the Rockets initially offered a non-guaranteed, three-year deal before offering him a guaranteed one, MacMahon tweets. “We rejected both offers and asked the Rockets to convert him for the remainder of the season,” Brothers said. House’s representatives want him to be a restricted free agent at the end of the year. 7:51pm: The Rockets are expected to sign a wing to a 10-day deal on Wednesday, Jonathan Feigen of the Houston Chronicle reports (Twitter links). It appears unlikely that the team reaches an agreement with Danuel House on a standard NBA contract today, meaning the team has a need for another perimeter player. House remains on a two-way deal with the organization, though has already spent 45 days (the maximum allowed) with the NBA club. House has been offered a deal by the Rockets but has declined it. Keith Smith of Yahoo Sports tweets that 25-year-old was offered his choice of the rest of the season on a minimum-salary deal or a two-year deal at the minimum. The Rockets were unwilling to go further given their luxury tax issues. Tim MacMahon of ESPN.com confirms (Twitter link) that House, who has been starting for Houston, has been offered a deal. Feigen notes that the Rockets and House still could come to an agreement but it’s not an expected outcome. He’ll be in the G League when the Vipers, Houston’s affiliate, plays on Wednesday. James Nunnally may be a potential fit for the Rockets, Feigen tweets, adding that the team has contacted Nunnally but no offer has been made at this time. Jodie Meeks and Brandon Rush are among the veteran wing options available on the free agent market. Despite all of the attention on Anthony Davis and the speculation about his long-term future, Scott Kushner writes for The Journal Times that the Pelicans have more pressing issues to solve, most notably their inability to close out games. As Kushner points out, the Pelicans are the worst clutch team in the NBA, as they are 5-11 in games that are within five points in the final five minutes. In fact, during those situations the Pelicans are outscored by 28.6 points per 100 possessions, the worst net rating. This is a stark contrast to last season, when the Pelicans led the league in clutch wins with 30. Before they have to deal with Davis’ future, the Pelicans have to figure out how to win this season, which will often come down to their ability to close out games in crunch time. With Chris Paul out for the next couple of weeks, Brandon Knight is ready to step up and contribute if given the playing time. As Jonathan Feigen writes for The Houston Chronicle, Knight has struggled to find his shot since returning from injury, and with the Rockets adding Austin Rivers earlier today, Knight may find himself short on minutes in the rotation. Danuel House has provided an unexpected lift for the Rockets off the bench in recent weeks, and he even started against the Spurs this weekend due to Paul’s injury. As Feigen reveals for The Houston Chronicle, starting in his hometown was a meaningful experience for House. When asked about his comments regarding his desire to play with Anthony Davis, LeBron James mentioned several other great players in the league that he would love to play alongside. As SportsDay Dallas points out, James included Mavericks rookie Luka Doncic in that list, highlighting his respect for the rookie’s strong start to the season.